If you’ve ever wanted to be king of the race track, now is your chance. Chrysler Group’s SRT (Street and Racing Technology) Motorsports team in collaboration with Riley Technologies has developed the ultimate Viper. And Chrysler is taking orders now for the incredible machine. How much will it cost you to get the keys to this V10 race car? Chrysler says the “estimated” cost will be around $459,000 USD. Is it worth the cost over the standard street-version SRT Viper? 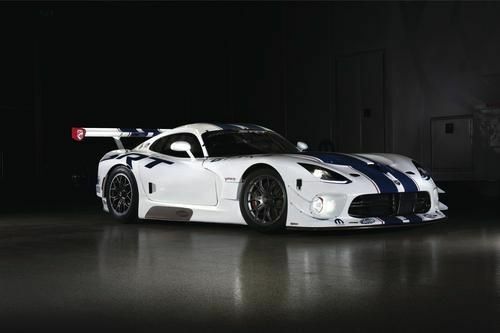 Chrysler says the visual similarities between the SRT Viper street car and the non-street legal GT3-R are deliberate. But that is where the similarities end. It starts underneath the hood with the new track-ready race car getting a similar V-10 engine that Chrysler has not released official power numbers. But AutoCar is reporting it will be in the 680bhp range. That will be enough for any serious weekend warrior to destroy the competition. The chassis has been built by by Riley Technologies in Mooresville, N.C. and is equipped with a highly-efficient aerodynamic package to optimize handling. Other features include Xtrac six-speed sequential transmission with paddle shifters, six-piston front brake calipers with four-piston rears, lightweight wheels and a multi-disc race clutch for maximum performance from the powerful V-10 engine. Factory parts support will also be offered on the race car. According to Ralph Gilles, President and CEO, SRT Brand and Motorsports, the Viper GT3-R is a culmination of nearly two decades of racing development. The new SRT Viper GT3-R is the direct descendent of the high performance GTS-R campaigned by SRT Motorsports in the LM GTE Pro Class at the 24 Hours of Le Mans and the American Le Mans Series (ALMS). Chrysler says the new GT3-R gets the same technology developed by the Chrysler Group for the factory GTS-R for engine, chassis, suspension, electronics and aerodynamics. "The SRT Viper GT3-R is the next logical progression of our successful Viper GTS-R, a championship-proven formula that has captured some of the world's most prestigious races," Gilles said. "Like every Viper race car, the GT3-R is a direct descendant of the SRT Viper street car. There is no mistaking the similarities between the two which is a key component of this class of sports car racing. The GT3-R stays true to the visceral appeal of the Viper and has been carefully evolved for the demands of racing at a world class level." The new SRT Viper GT3-R is likely the most fearsome track-ready sports car in the world and is ready for any track around the globe. If you have $459,000 to put down on the table, orders are now being taken by Chrysler for late 2013 delivery.